3 Bedroom Detached House For Sale in Alton for Guide Price £650,000. 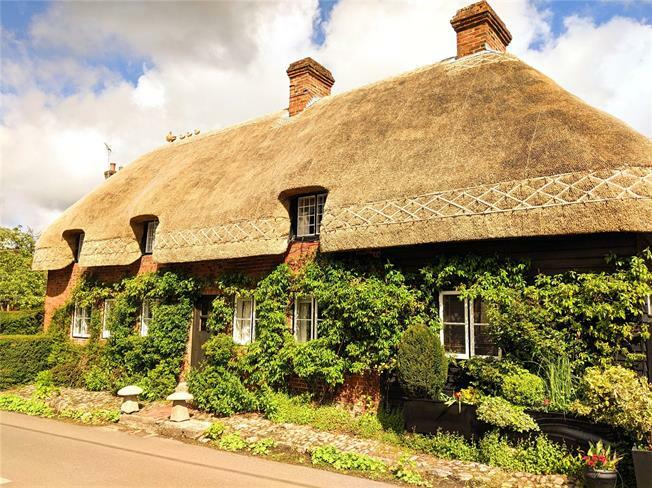 A delightful Grade II Listed detached thatched cottage of immense character standing in a very fine village position with views of the Hanger. The property is believed to date from the 17th Century and takes full advantage of the features associated with a building of this period with exposed ceiling and wall timbers, old latch doors and two Inglenook fireplaces. The generous accommodation is larger than first anticipated with exposed brick and stone walls and flooring providing light and well-proportioned rooms. There is a lovely farmhouse kitchen/breakfast room with a terracotta tiled floor, Butler sink, panelled walls and an Aga. The spacious sitting room has an Inglenook fireplace with a brick hearth, bread oven, canopy and a wealth of exposed timbers. There is a separate dining room with an exposed stone wall and an Inglenook fireplace. In addition, there is also an extended hall which has been used as a study area and is fondly known as the 'long room'. The accommodation is further complemented by a cellar. There are two double bedrooms and a single bedroom with some wonderful exposed oak floorboards and timbers to the first floor. Of note, listed planning consent (now lapsed) was granted in April 2015 to add an en suite shower room to bedroom one and a cloakroom to bedroom 2 (SDNP/15/00586/LIS). The cottage occupies a very fine location, close to the heart of the village, on Gracious Street with views towards the Hanger. Gracious Street is a small rural lane leading out to open country and the village of Newton Valence. Selborne has a strong community with a public house, shops, church, primary school and is set amidst fine Hampshire countryside within the South Downs National Park. The village is renowned for its association with Gilbert White, the 18th Century naturalist and is surrounded by scenery of outstanding natural beauty lying at the foot of a beech covered hanger. The larger centres of Liss, Alton, Petersfield and Farnham collectively provide a range of facilities as well as mainline stations to London Waterloo. Also, the A3 can be accessed at Liss providing a route to London and the south coast. The partly walled garden is a particular feature of the cottage and provides a beautiful setting. A pair of double gates provide access to a courtyard garden adjoining the kitchen. This area has been used for off road parking for a small car. The rear garden has been landscaped for ease of maintenance with a variety of climbers, shrubs, roses and several young and mature trees. A network of shingle pathways culminate at an ideal outside seating area for afternoon and evening sun. To the rear, there is a separate vegetable garden. Two sheds. Oil tank.